Cephalectomy is a Nova Scotia band and they recently released a new CD, The Dream Cycle Mythos. I have designed and constructed this special edition for them: a drop-back box in full black sheepskin leather. 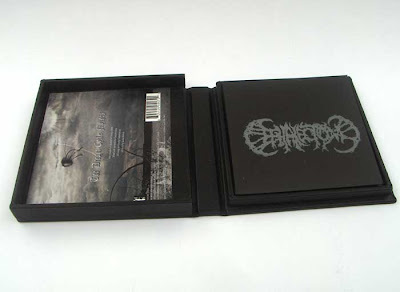 This special numbered edition is available through the band's label, Discorporate Music. I hand printed their logo on the cover and on the insert, using a lino cut that I created for this project. 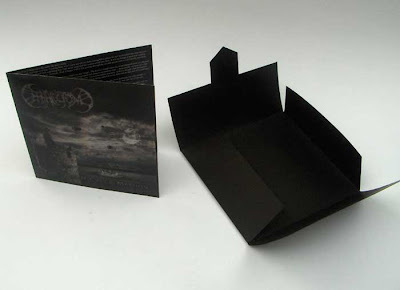 The insert is a folded wrapper structure with a tab closure and it contains the graphics and lyrics as well as a certificate of authenticity. 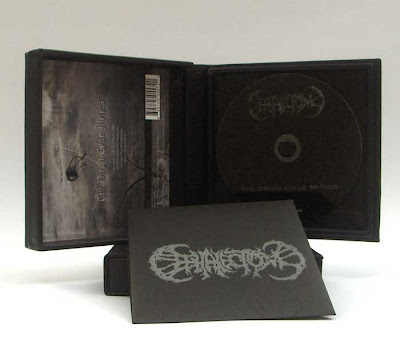 If you're wondering what kind of music is inside this box, Cephalectomy's new release is described thus: "The Dream Cycle Mythos" shatters dreams and brims with an originality that is sorely absent from other releases in the death/grind genre. No stones are left unturned on this musical masterpiece -- it is a single song that stretches beyond the 23-minute mark. Thunderous blast beats transition to extreme melody, off-time riffs, heavy metal crunch, and even sprinklings of classic rock. However, metal is the name of the game here with Cephalectomy's fourth official release for Discorporate Music. The lyrics spin a tale of a clearly unstable mind as it experiences new dimensions and the horrifying visions within. Not quite sure about the CD though I do often like music that surprises me, but how lucky are they to have you design such a fabulous box! That is one nifty CD case! Love the lino cut design. The leather is a beautiful touch. Nicely done! "Thunderous blast beats transition to extreme melody..."
Thanks Carol, and yep this music might surprise you! And although it isn't my first choice for music, this group is very good at what they do. The musicianship is quite masterful and advanced. Thank you rachael and tangente and rozi! haha, derekl, you are right. it's really loud stuff! what a gorgeous construction Rhonda - it looks great.